Dr. Francis Fukuyama is a professor at Stanford University—the Olivier Nomellini Senior Fellow at Stanford’s Freeman Spogli Institute for International Studies—and a longstanding observer of global political and economic issues, with a special emphasis on the development of democratic political systems around the world. He is also Director of the Center on Democracy, Development and the Rule of Law (CDDRL) at Stanford. He has previously taught at Johns Hopkins University’s Paul H. Nitze School of Advanced International Studies, where he was the Bernard L. Schwartz Professor of International Political Economy and director of the School’s International Development program. Dr. Fukuyama has written widely on issues relating to democratization and international political economy. Fukuyama’s book The End of History and the Last Man has appeared in over twenty foreign editions, and The Origins of Political Order: From Prehuman Times to the French Revolution was a 2011 New York Times Notable Book and a Kirkus and Globe and Mail Best Book of the Year. In 2014, he released the heavily anticipated follow-up, Political Order and Political Decay: From the Industrial Revolution to Globalization. His other books include America at the Crossroads: Democracy, Power, and the Neoconservative Legacy, and Falling Behind: Explaining the Development Gap between Latin America and the United States. 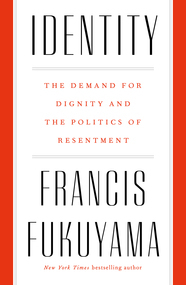 His 2018 release, Identity: The Demand for Dignity and the Politics of Resentment, examines modern identity politics. Dr. Francis Fukuyama has served as a member of the Political Science Department at the RAND Corporation in periods from the 1970s to the 1990s. In 1981-82 and in 1989, he was a member of the Policy Planning Staff of the US Department of State, first specializing in Middle East affairs, and then as Deputy Director for European political-military affairs. In 1981-82 he was also a member of the US delegation to the Egyptian-Israeli talks on Palestinian autonomy. From 2001-2004 he served on the President’s Council on Bioethics, established by President George W. Bush. Dr. Fukuyama received his B.A. in classics from Cornell University and his Ph.D. in political science from Harvard University. From 1996-2000, he was the Omer L. and Nancy Hirst Professor of Public Policy at the School of Public Policy at George Mason University. Dr. Francis Fukuyama is chairman of the editorial board of The American Interest, which he helped to found in 2005. He is a senior fellow at the Johns Hopkins SAIS Foreign Policy Institute, and a non-resident fellow at the Carnegie Endowment for International Peace. He holds honorary doctorates from Connecticut College, Doane College, Doshisha University and Kansai University in Japan, and Aarhus University in Denmark. He is a member of the Board of Trustees of the RAND Corporation, the Board of Directors of the National Endowment for Democracy, and member of the advisory boards for the Journal of Democracy, the Inter-American Dialogue, and The New America Foundation. He is a member of the American Political Science Association and the Council on Foreign Relations. He lives with his wife Laura Holmgren in California, and has three children. Follow Dr. Fukuyama on Twitter. Taking up the essential question of how societies develop strong, impersonal, and accountable political institutions, Fukuyama follows the story from the French Revolution to the so-called Arab Spring and the deep dysfunctions of contemporary American politics. He examines the effects of corruption on governance, and why some societies have been successful at rooting it out. He explores the different legacies of colonialism in Latin America, Africa, and Asia, and offers a clear-eyed account of why some regions have thrived and developed more quickly than others. And he boldly reckons with the future of democracy in the face of a rising global middle class and entrenched political paralysis in the West. 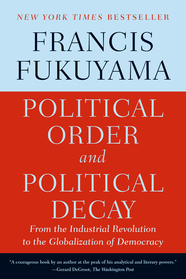 Francis Fukuyama, author of the bestselling The End of History and the Last Man and one of our most important political thinkers, provides a sweeping account of how today's basic political institutions developed. The first of a major two-volume work, The Origins of Political Order begins with politics among our primate ancestors and follows the story through the emergence of tribal societies, the growth of the first modern state in China, the beginning of the rule of law in India and the Middle East, and the development of political accountability in Europe up until the eve of the French Revolution. A decade after his now-famous pronouncement of "the end of history," Francis Fukuyama argues that as a result of biomedical advances, we are facing the possibility of a future in which our humanity itself will be altered beyond recognition. Fukuyama sketches a brief history of man's changing understanding of human nature: from Plato and Aristotle to the modernity's utopians and dictators who sought to remake mankind for ideological ends. Fukuyama argues that the ability to manipulate the DNA of all of one person's descendants will have profound, and potentially terrible, consequences for our political order, even if undertaken with the best of intentions. 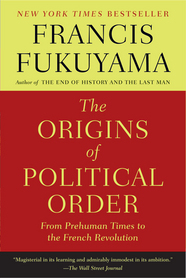 The Origins of Political Order Dr. Fukuyama draws from his latest book to explain and interpret contemporary global politics. The first of a major two-volume work—hailed by The New York Times Book Review as "ambitious, erudite and eloquent . . . undeniably a major achievement by one of the leading public intellectuals of our time"—The Origins of Political Order tells the story of how humans developed the political institutions we have today, starting with politics among our primate ancestors and tribal societies, and leading up to the eve of the French Revolution. Trust in Societies and Organizations Drawing from his 1995 book Trust: The Social Virtues and the Creation of Prosperity, Francis Fukuyama discusses where trust comes from, what it does, and how to get more of it. 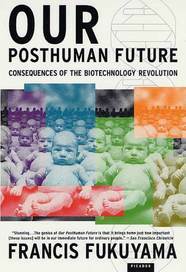 Our Posthuman Future Dr. Fukuyama discusses the social and political consequences of new developments in biotechnology. Listen to Francis Fukuyama’s full-hour interview on KERA’s Think. San Francisco Chronicle gave a comprehensive review of Identity and also recommended Identity. Watch Francis Fukuyama’s interview on Al Jazeera’s Up Front. Identity is one of The Times (UK)’s best Political books of 2018 and one of the Financial Times’ best Political books of 2018. The Hindu (India) reviewed Identity in conjunction with Asad Haider’s Mistaken Identity. Francis sits down with NPR All Things Considered to discuss Identity. The New York Times Book Review reviews Identity and features it as an Editor’s Choice. The Wall Street Journal and The New Yorker review Identity. Francis discusses the erosion of political order with the Economist. Check out Francis’ work for the American Interest. Francis on the rise of China, East Asia tensions, and the role of the United States for the Diplomat. The Economist – Open Future – Fukuyama answered Five Questions about identity politics accompanied by an excerpt from IDENTITY and he appeared on The Economist Asks podcast. Fareed Zakaria discussed Identity in conjunction with an interview with Bono about Europe’s populism in The Washington Post – 9/20 and also on his show Fareed Zakaria GPS/ CNN. The article was picked up by The Arizona Daily Star. Read an article from Stanford Magazine on identity politics by Fukuyama. Find out more about Francis Fukuyama and follow him on Twitter. "Everything went so well yesterday. We had a sold out event, and I didn’t get anything but positive reviews about both the luncheon and presentation!" " An excellent lecture, with clarity of reasoning and a very interesting content. It was much appreciated by all."